TOEIC is, an English language test designed specifically to measure the everyday English skills of people working in an international environment, according to Wikipedia. So, how does the TOEIC test score each test taker's English skills? 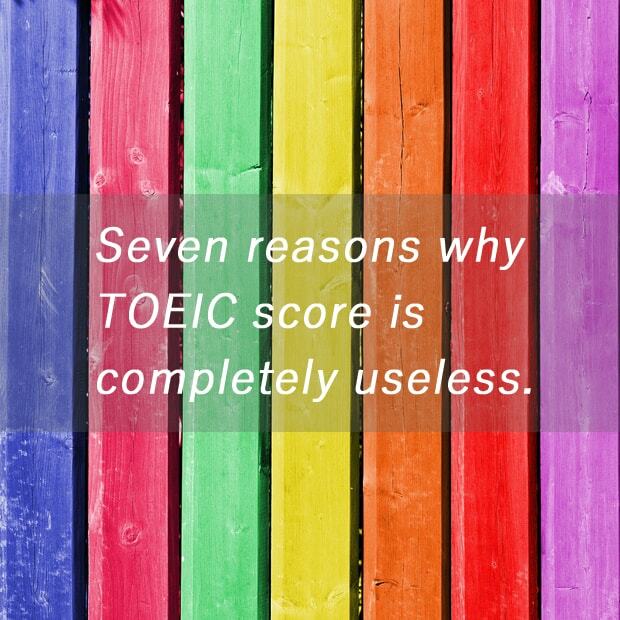 So today, I'll introduce the seven reasons why TOEIC socre is completely useless! When you meet people from Europe, Southeast Asia or any other places where people don't speak English as a first language, you'll most likely talk to them in English (and that's why you should learn English). You'll soon notice that they speak good English, and you might want to know their TOEIC score. Bummer! Unfortunately, they even don't know what the TOEIC is. In the last two decades TOEIC test became very popular in Japan, especially among the young workforce and the university students. Indeed, 30 percent of people who take TOEIC test are Japanese people who don't speak English. While many Japanese people who can't say a word in English take TOEIC test many times, some intelligent people who get fluency in English learn real English in different ways. Whatever the TOEIC score people have, when you talk to them in English you'll know if they have sufficient English communication skills or not. As long as you're focusing on TOEIC test and just aiming to get a higher score on it, you'll never be efficient at learning English. Do people who marked high score on TOEIC can speak good English? Sad to say, a high score of the TOEIC test like over 800 or over 900 doesn't assure their English communication skills. They can easily get nervous when it comes to speaking English. Seeing all these situations of people who take TOEIC test, and those who have marked high socre but can't speak good English, TOEIC score is completely useless to measure everyday English skills of them. Therefore, TOEIC score will soon no longer regarded as an important English test. I'm sure of it. To sum up, I don't support the idea of taking TOEIC test regularly. Open up your eyes to the world, there are many other ways to measure your progress in your English skills. For example, what if you make English native friends and talk to them once in a while? They will tell you "Wow, you're English has got much better! ", and you'll feel much more grateful when you hear that, won't you? Well, that's all for today's journal. Thank you for reading. Please feel free to leave a comment and correct my English if there are mistakes. See you next time!